In the past one year, Indonesian new retail startup Warung Pintar has made several exciting milestones. But for CEO and Co-Founder Agung Bezharie Hadinegoro, there are two most important milestones that they have achieved: The number of mom-and- pop shops or warung that they have managed to help (which has reached beyond 1,300 shops) and the significant increase of their monthly income (which has gone beyond 41 per cent with 22 per cent of them experiencing at least 10 per cent growth each month). 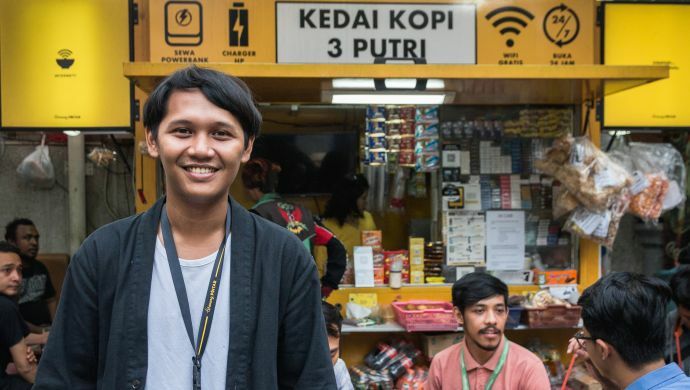 “[Through these milestones] we were able to validate that offline transactions are in dire need of ‘online touch’, especially seeing how much efficiency has been brought by the Warung Pintar platform. Plugging into our software turns out out to be really helpful for their business process,” he says in an interview with e27. Launched in January 2018, Warung Pintar aims to help warungs –an essential part of the daily lives of Indonesians– embrace the digital era by enabling them to perform online transactions and digitising their bookkeeping, warehousing, distribution, and cash register process. However, the company’s five-year vision goes beyond enabling cashless payments on warung. In addition to help these small businesses becoming more efficient, they also aim to help the FMCG industry generate and track data. Hadinegoro explains how the FMCG industry has a “very big market” in Indonesia with almost 70 billion items moving in the supply chain. However, 70 per cent of distribution of these goods are still being done through traditional marketplaces or sellers. This has made it impossible for businesses to track its data, as well as measure inefficiencies and losses. “We always talk about how to use Big Data, but the main problem here is how to generate the data first. There is very little data generated at the supply chain and retailers; you can never bring in efficiency with that as the data is neither big nor clean enough to know what is happening,” he elaborates. “There are still many people who trade in the same way as 50 years ago. This is what we try to revolutionise. We might change the way we do things through disruption, but through a revolution, we aim to come up with something entirely new,” the CEO adds. When asked about the challenges that the company faced in acquiring its users, Hadinegoro said that instead of acquiring users, the greatest challenges actually lie in maintaining them. “You can ask all tech companies, their problem would be the same. You can get 100 merchants on board each month, but how many of them are actively using the platform?” he says. “So the question is how you can make them stay … [User] acquisition is all about spending money but keeping them is all about how good your product is,” he continues. Hadinegoro points out that Warung Pintar’s target audiences are not the usual early adopters of tech companies’ services. The problem is not that they are unwilling to do it; the problem is that the products are not designed for them. “Smartphones may not be made for ojek drivers, but Go-Jek and Grab are made for them. So it’s all about building a human-centered design,” he concludes. In addition to that, the company also puts emphasis on hiring quality talents for their product team. Hadinegoro is one of those startup founders who actually began his entrepreneurship journey by working in a venture capital firm. Warung Pintar started out as a side project at East Ventures, but external investors then began to convey their interest in the project. Hadinegoro’s involvement in the project was fueled by his passion in helping small- and medium-sized enterprises (SMEs). In his work, he claims to be inspired by the achievements that his grandmother has made. A paediatrician and an academic, his grandmother works in developing vaccines and has advised the government in public health-related matters. “She could have made a lot of money but her country needs her money more … I learned that infant mortality rate, from the time she began working as a doctor, has decreased dramatically, thanks to the hard work of her and her colleagues,” Hadinegoro says. “In measuring the value of what we do, we need to go beyond using ‘happiness’ as a reason. Ironically, many tech blogs on Medium seem to focus on that. What we need isn’t happiness; what we need is usefulness,” he continues. “Because you can be happy and useless at the same time. But when you’re useful, you will feel happy,” he closes.